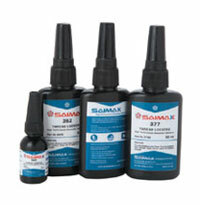 Saimax Threadlocker adhesives are widely used in a broad range of applications such as engine assembly, gear box, fuel injection components and transmission assembly. Saimax products include blue threadlocker and red threadlocker among many other types of quality adhesives that are specified by some of the large engine manufacturers for use on factory assembly lines. Saimax products meet US Military specifications and certified by DVGW and WRAS. The products are specially formulated by focusing mainly on innovations to provide tough and durable bonding to a wide range of surfaces. Automotive Specified: Noncorrosive. Conforms to ASTM D 5363 AN0311 (Mil-S-46163A, Type II Grade M. Ideal for fasteners under ¼” (6 mm) that requires some adjustment. Removable with hand tools. Applications: Fine threads, body panel mounting fasteners, assembly and fuel injection set screws, carburetors, relay locks, headlamps, throttle body assembly, choke assembly, etc. Automotive Specified: Multi-purpose medium strength threadlocker conforms to ASTM D 5363 AN0321 (Mil- S-46163A, Type II, Grade N). Designed for almost all bolt and nut applications ¼” to ¾” (6mm to 20 mm). Removable with hand tools for easy disaasembly. Applications: Carburetor studs, drive shaft bolts, rocker arm adjustment nuts, valve cover bolts, water pump bolts, oil pan bolts, etc. Automotive Specified: All-purpose medium strength threadlocker that works on oily surfaces. Ideal for all wide variety of bolts and nuts ¼” to ¾” (6 to 20 mm) in size. Removable with hand tools for easy disaasembly. Applications: Alternators, pulley assemblies, intakes, bolts on valve and cam covers, rocker studs, rocker adjustment bolts, disc brake calipers, oil pans, etc. Automotive Specified: High strength adhesive applied to fasteners 3/8” to 1” (10 to 25 mm) in size. Ideal for heavy duty applications where vibration and shock are extreme. Conforms to ASTM D5363 AN0331 (Mil-S-46163A, Type II Grade 0). Applications: Transmission shaft bolts, cylinder block bolts, ring gear bolts, engine block cup & core plugs, water pumps seals, hub & shaft assemblies, etc. Automotive Specified: Designed for demanding applications (3/8” to 1” 10 to 25 mm). Ideal for locking studs and press fits. Special tools or heat may require for disassembly. Conforms to ASTM D5363 AN0221 (Mil-S-46163A, Type I, Grade K). Applications: Frame bolts, shock absorber bolts, ring gear bolts, cylinder block and rocker arm studs, etc. Automotive Specified: High temperature/high strength thread locker for heavy-duty applications. Prevents bolts 3/8” to 1 ½” (10 to 38 mm)from loosening due to vibration, shock, and environmental stress. Ideal for temperatures resistance up to 4500F (2320C). Removable with hand tool and heat. Applications: Transmission input & output, shaft threads, camshaft sprocket bolts, crankshaft bolts, press fit filter tubes, idler bearings, sing gear or shock bolts, etc. Automotive Specified: High viscosity adhesive for locking and sealing large bolts and stud 1” (25 mm) + or larger diameter. High strength thread locker conforms to ASTM D 5363 AN0211 (Mil-S-46163A, Type I, Grade L). 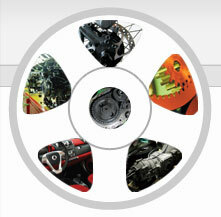 Applications: Shock absorber mounts, Wheel studs, Frame brackets, suspension fasteners, etc. Automotive Specified: Low viscosity adhesive wicks into the threads of preassembled fasteners to secure them in place. Designed for fasterners ranging from #2 to ½” (2.2 to 12 mm) in size. Medium strength adhesive conforms to ASTM D5363 AN0261 (Mil-S-46163A Type III, Grade R). Applications: Carburetor adjustment screws, air conditioning belts and distributor clamps, bolts on alternators, fill hairline cracks, etc.